Summer feels like it takes forever to get here, and then it leaves sooner than I want it to. Winter is the exact opposite. I could do without all the cold, snow, ice, and ick... but it's back upon us before we know it. And it takes forever to go away! Bi-Summeral. That's what I want to be. But, alas. I am not, and August is in the books. 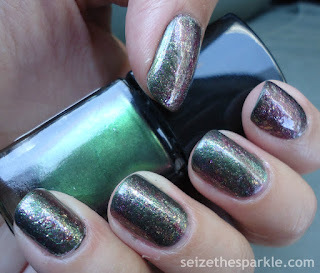 Maybe looking at my favorite manis from the month will keep your head in Summerland just a liiiiiittle bit longer. It's worth a shot, right? 1. Fishbowl Friday 042 - I still really love the way this manicure turned out, even if it was a little Christmasy. If it wasn't making me think of that cheerful time of the year, I was thinking about Peanut since it's her birthstone. Sentiment always ranks high with me! 2. Layering: Iris Garden - I was so surprised by the fact that one of my OPI Colorpaints worked to create a jelly glitter sandwich. I really thought that was impossible. I'm thinking this might be a good base for a pond manicure. The idea is the same as a jelly glitter sandwich, just more layers to create depth like what you'd see in a pond. I told the girls in HPB that someone needs to recreate the zombies from the cave in Harry Potter and the Half Blood Prince. It would be a great Halloween mani! 3. SinfulColors Late Night Haute - This was an unexpected color combination that I ended up loving. I was going for unexpected, and I wanted to really show how differently each 3D glitter could look over different base colors. Maroon with teal sparkle? But it works and I still love it! 4. Wet n Wild I Moss Have It - Words cannot describe how much i love this green polish. If you took this shade and added in a bright pink duochrome... well, there wouldn't be a need for me to recreate watermelon Tourmaline, now would there? The combination of this color and finish are just stunning! 5. 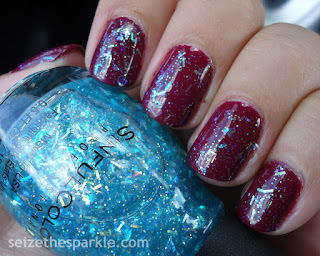 Fishbowl Friday 040 - I love creating messy gradients like my Punk Nails. There was an awesome balance of tough girl meets sparkle on my nails with this one. I'll definitely be wearing variations of this again! I made this for dinner last week and it was ah-mazing. It's a one skillet dish that's not only easy but super flavorful. I subbed ground chicken in for the turkey because that's what was in the freezer! I also added in black beans. We made soft tacos and ate this with tortilla chips. The rice and beans made it really filling. Soooo yummy! This pizza from the same blog looks incredible, too. I've pinned a couple recipes from Budget Bytes. Her blog focuses on creating really great tasting meals without breaking the bank. Each recipe has a breakdown for cost. Also, there's never a long list of ingredients that I need to pick up in order to make one of her recipes. Chez Sparkle has a pretty well-stocked spice cabinet, but some recipes I've pinned from other sites get a little ridiculous! The recipes on Budget Bytes cover a bunch of different cuisines and range through the courses of a meal. You're pretty much guaranteed to find a recipe to drool over! When The Mercurial Magpie posted this polish, it was an instant lemming. I followed the links to purchase it, but it must've sold out quickly! There's just something about pink, shimmery, glittery polish that turns me into a straight up seagull! OPI came out with their Colorpaints earlier this Spring. Essie followed suit with their Watercolors that I've yet to find in stores. If you've had trouble getting your hand on either of those collections, Sephora X came out with a paired down set. Fashion Polish posted about the five polish set halfway through August. The set is available through Sephora for $29.50. When it comes to nail blogging, I'm always looking for helpful resources. Dina from Secretary's Nail Art posted about The Dictionary of Colors. It's a guide to color names and shades. Definitely required reading and pinning for every nail blogger! Steph from Imperfectly Painted really brought the nostalgia with her post on Revlon Just Tinted Desire. Way back in the days before Polish and Prose, the Just Tinted line came up in my first search about Jelly Glitter Sandwiches. I had always hoped I'd come across a bottle, but as time wore on, I became okay with the fact that I might never own one of the four Just Tinted shades. It was really cool to see swatches and read about the polish in a little bit more depth, and from quite a different perspective! Thanks to G from Nouveau Cheap, I'm on the lookout for The Fiery Temptress Collection from Revlon, but so far I haven't spotted it... Untamed looks absolutely gorgeous and I need, Need, NEED it in my stash! She's also got me searching for Olay Active Botanicals Skincare with Snow Mushrooms.